As the U.S. economy experiences a slow recovery, the situation remains bleak for one demographic in particular: young Americans. 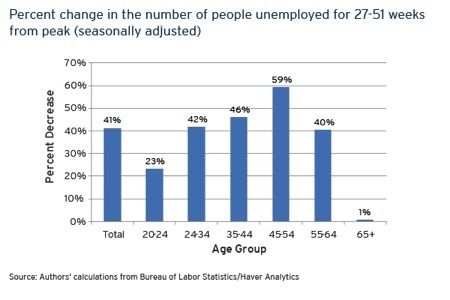 The Bureau of Labor Statistics reported the nationwide unemployment rate at 7.6% in June, but that figure doesn’t capture the glaring disparity between young and middle-aged or older Americans. According to the Fed, the unemployment rate for young Americans (ages 16 to 24) sits at an eye-watering 16.2%, more than double the rate of 6.8% for adults. While younger Americans have historically had a harder time finding employment than older Americans, evidence suggests the Great Recession exacted an abnormally high toll on the country’s youth. An article from The Economist notes that in times of economic downturn, “Many employers sack the new hires first.” Younger workers are often the “last in, first out,” as employers rely on more experienced workers. Even the 16.2% figure does not fully capture the problem. The OECD estimates that an additional 14.8% of young Americans can be classified as NEET’s, or “Not in Education, Employment, or Training.” Taken together, a significant portion of young Americans are either unemployed or not enrolled in any type of education or training to increase their chances of eventually finding a job. Moreover, a recent report cited by Fox Business shows that 4.7 million young workers are underemployed, meaning they are working part time when they would prefer to be working full time. The combined cost of youth unemployment and underemployment could result in $20 billion in lost earnings over the next decade. 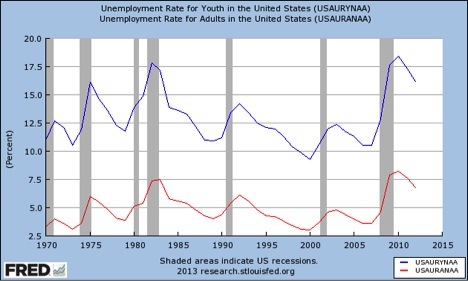 Perhaps more concerning is the trend of long term unemployment for young Americans. In a Bloomberg Economic Brief, economist Joseph Brusuelas estimated that 1.3 million 16 to 24 year olds have been unemployed for 6 months or more, suggesting a persistent difficulty for young Americans to find lasting employment. A recent article from The Brookings Institution took note of how the current problem of long term youth unemployment seems to be worse than it has been in most post-recession periods. Forty-four months into an economic recovery (as we were in February 2013), youth unemployment after past recessions had typically returned to pre-recession levels. Yet for today’s 20 to 24 year olds, the 44-month rate of unemployment was 237% of what it has been historically. Data from the article also shows that young jobseekers are faring the worst in the recovery. Since reaching its peak, extended unemployment has decreased only 23% for 20 to 24 year olds, compared to an average decrease of 41% for all age groups. A strong body of evidence suggests that long term unemployment affects young Americans not only in the form of lost earnings now, but also has “scarring” effects for these workers well into the future. Various research has shown that unemployment early in one’s career can create a wage penalty lasting up to 20 years. Lisa Kahn, a Yale business school professor, has perhaps done the most extensive study on the issue. In looking at the effects of graduating from college in a bad economy, she found that student s who donned a cap and gown in the recessionary times of the early 1980s faced considerable economic challenges. Many of these students began their careers unemployed or underemployed, earning significantly less than students with similar credentials who graduated into a strong economy. She found wage disparities lasting on average 15 years into these students’ careers. Aside from earnings, prolonged unemployment at a young age can have broader harmful effects on one’s career. An International Monetary Fund (IMF) brief titled, “Scarred Generation” notes how prolonged joblessness for young people can cause skills erosion and negatively impact an individual’s level of occupational attainment. The beginning of one’s career is also a crucial time to establish connections, so a spell of unemployment early on can harm a young person’s ability to build and maintain valuable networks. There can even be psychological effects from youth unemployment. It can create a distrust of socioeconomic and political systems and harm an individual’s overall level of happiness. Job dissatisfaction is also common, as a survey conducted by Accenture found that 41% of college graduates from the last two years are in jobs that don’t require a degree. Perhaps the most important point made in the IMF brief is that “the longer a person is unemployed, the longer the scarring effects are likely to last.” These consequences, including the wage penalty, only worsen as the length of unemployment increases. What does all this mean for the United States economy as a whole? Youth unemployment translates to slower long term growth and less aggregate demand as a weaker, “scarred” workforce replaces the retiring baby boomers and assumes a primary role in the economy. Furthermore, if the skills of these young workers erode during spells of unemployment, it’s especially bad for a 21st century knowledge economy where human capital is increasingly valuable. As a young person myself, this news troubles me. Considering also the future threat of a heavy tax burden imposed on young people to pay for this country’s debt and broken entitlement system, I can’t help but a feel bit unsettled about what’s in store for us. In the meantime, I will remain cautiously optimistic. Yet if the United States is to drive growth and increase its competiveness in a growing global economy, evidence suggests that it needs policies not merely aimed at employment as a whole, but specifically targeted at greater youth employment.